Monthly meetings, open to all, on a variety of philosophical issues. Anything goes. 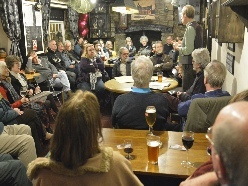 The Tintern Philosophy Circle meets in the Rose & Crown Pub, situated at the centre of Tintern on the A466 main road, at 7.30pm on the third Tuesday of every month, except August. · epistemology – what can we know, and how do we know it? · individual identity – who, or what, are we? · teleology – does life have any purpose? · time and fate – are events predestined? · ontology – can something come from nothing? This talk will look at these themes in a number of plays, including Hamlet, Othello, Macbeth, King Lear and The Tempest. No previous knowledge assumed! Steve Eddy is an author of school English textbooks and literary study guides, especially on Shakespeare, and a book on mythology. He has also taught English and Philosophy at Monmouth School. Events are open to anyone interested in philosophy, and no prior knowledge of philosophy is needed. We hold to no creed other than belief in the value of tolerant, friendly discussion about things that matter. The Circle is run by Professor John Clarke with Vanessa Dodd, Maria Taylor and Steve Eddy. Monthly events are introduced by members of the circle, or by a guest speaker. Our meetings are held on the third Tuesday of every month (except August), starting at 7.30, at the Rose & Crown, Tintern, NP16 6SE, Tel: 01291 689254. Evening meals are served here.